A & B Kennel is located in the Flint Hills Region of South Central Kansas. We live on a ranch and raise cattle, but raising dogs has become an enjoyable and rewarding part of our life. 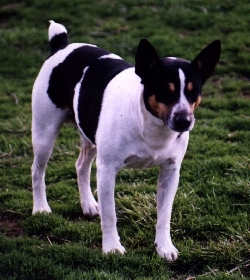 We began breeding dogs shortly after acquiring our first Rat Terrier, Butch, in 1994. Since then, we have begun breeding Miniature and Standard Dachshunds, Pembroke Welsh Corgis, and Miniature Schnauzers. All of our puppies are hand-raised, and are whelped in our outside kennels in igloo doghouses. We have had very good luck with this arrangement. The puppies get lots of attention every day and are very outgoing. I remove dewclaws, and dock the tails (except for the dachshunds). All dogs are on a strict vaccination and worming program, and keep the entire kennel on a strict sanitation program. We can ship from our area to any location requested. Upon request, we can send pictures and prices of any dogs for sale. In our breeding program, we strive for healthy individuals with outgoing personalities, so that they will be happy puppies for anyone. Our dogs are guaranteed, and will be happy to furnish references of people who have purchased our dogs. Our main goal is to raise good quality and healthy dogs and be able to furnish someone with a very loveable companion. It is such a fulfilling feeling seeing how happy a person is when they take home one of our puppies. We have several customers that keep us updated on their new addition and how some of the dogs have given them a better outlook on life. This is the most rewarding feeling associated with our job.